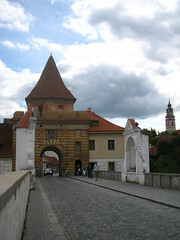 The only remaining town gate in the historical town of Cesky Krumlov, which was built in 1598 - 1602. Originally there were 9 gates, which were there to guard the town, often as a part of the fortification. Most of the other gates were pulled down during the transportation and industrial development in the 19th century. Each tower used to have a small living space upstairs, and larger ones was even equipped with a kitchen and a toilet. Such spaces served as a small-size apartments or warehouses.